(…continued) Keller reminds his listeners that they grew up in a culture that has for centuries been grounded in and shaped by Christianity, and whether they know it or not, their idea of a God of love comes from the old, old story of Jesus and his love. Such an idea is found nowhere else. They may think they have rejected the Christian faith, even as they cling to its most basic precept: “Jesus loves me, this I know, for the Bible tells me so.” No one or no other book has ever told such a story. Jesus was inclusive of all, and welcoming to all. And Keller’s 20-something New Yorkers like that too. Throughout his ministry, Jesus was open to those of every age and race and nationality. But to everyone he said, “Come to me.” He said, “I am the way and the truth and the life.” He said, “God so loved the world that he gave his one and only son, that whosoever believes in me should not perish but have everlasting life.” And then Keller tells them how Jesus rose from the dead, and why they can believe that really happened, and how that validates everything Jesus said and did. And he tells them that is why we should listen to everything Jesus says, whether we like it or not. If Jesus is God, we should listen up; and they do. You are right, Keller says, God is love. But we’ve heard that from Jesus and from no one else. In the life, death, and resurrection of Jesus Christ we see the suffering, sacrificing love of God. Forgiveness always has a cost. There is always pain when someone must be forgiven. You know that if you have ever had to forgive someone who has hurt you. In the agony of Jesus on the cross we see made visible the suffering that is always in the heart of God over the unfaithfulness of the people he created. Keller invites his cynical, young New Yorkers to let him know if they can find such love of God anywhere else. They can’t, and they come by the thousands to find and worship Jesus in that congregation that still proclaims that truth. Christ is the King, for all time and in all places, even in New York. Believe in Jesus and you will be saved. I John 4:7-19 — Dear friends, let us love one another, for love comes from God. Everyone who loves has been born of God and knows God. Whoever does not love does not know God, because God is love. This is how God showed his love among us: He sent his one and only Son into the world that we might live through him. This is love: not that we loved God, but that he loved us and sent his Son as an atoning sacrifice for our sins. Dear friends, since God so loved us, we also ought to love one another. No one has ever seen God; but if we love one another, God lives in us and his love is made complete in us. This is how we know that we live in him and he in us: He has given us of his Spirit. And we have seen and testify that the Father has sent his Son to be the Savior of the world. If anyone acknowledges that Jesus is the Son of God,God lives in them and they in God. And so we know and rely on the love God has for us. God is love. Whoever lives in love lives in God, and God in them. This is how love is made complete among us so that we will have confidence on the day of judgment: In this world we are like Jesus. There is no fear in love. But perfect love drives out fear, because fear has to do with punishment. The one who fears is not made perfect in love. We love because he first loved us. Philippians 2:5b-11 — Have the same mindset as Christ Jesus: Who, being in very nature God, did not consider equality with God something to be used to his own advantage; rather, he made himself nothing by taking the very nature of a servant, being made in human likeness. And being found in appearance as a man, he humbled himself by becoming obedient to death— even death on a cross! Therefore God exalted him to the highest place and gave him the name that is above every name, that at the name of Jesus every knee should bow, in heaven and on earth and under the earth, and every tongue acknowledge that Jesus Christ is Lord, to the glory of God the Father. (…continued) Timothy Keller is a pastor in the Presbyterian Church of America, the more conservative of the two largest Presbyterian denominations. In 1987, he moved to Manhattan to try and start a new church for a largely non-churchgoing population. During the research phase of the new church start, he was told by almost everyone that it was a foolish attempt. Keller was moderately conservative, New Yorkers were liberal and edgy. Church meant traditional families, the city was filled with singles and ‘non-traditional’ families. Church meant belief, but Manhattan was the land of skeptics, critics, and cynics. The middle class, the usual market for the church, was fleeing the city because of rising costs. That left the wealthy, the sophisticated, and the hip, most of whom just laughed at the idea of church. The congregations that were in the city were dwindling, most barely able to even maintain their buildings. Nevertheless, Keller started Redeemer Presbyterian Church from scratch, and within 20 years it had grown to more than 5,000 attendees, along with spawning more than a dozen satellite congregations in the immediate metropolitan area. The churches are multi-ethnic, diverse, young (average age 30), and two-thirds of the members are single. The church in America is not dead, and that old-time religion can still speak and change hearts. One of the things Keller does is he engages in conversation with his young and cynical attenders. He takes their questions seriously, and then he responds with questions of his own. Let me give you an example relating to this morning’s theme. Many young New Yorkers would consider offensive the very idea of Christ as King. First of all, the image of a King is too authoritarian for them, too much like the establishment. Second of all, it is too male-oriented; as is the rest of the Bible, they say, seeing no room for their strident feminism. And why all this emphasis on Christ in the first place? Sure, Jesus might have been a good guy, but what about all the other religious leaders? They say Christians act like they are the only ones who have the truth. And what about this dying on the cross business? If God wanted to forgive everyone, why didn’t he just say, “Okay, you are off the hook,” and leave it at that? And what does one man’s death on a cross 2,000 years ago have to do with me today? Besides, there are too many rules in Christianity. Why can’t it just be me and God? I have God in my heart and God is love and isn’t that enough? Oftentimes someone will say ‘God is Love,’ as if that settles it once and for all. Keller will then say, “No, not everyone does know that or believes that at all. What makes you think so? Is it obvious from the world around you that God is love? It doesn’t look that way to me– not without the Bible to explain a few things. Should we trust what the ‘God in our heart?’ tells us? The God in some people’s hearts tell them to kill other people. In what religion of the world do you see a God of love? Buddhism teaches a way of life, but not a god of love. Hinduism says the universe is god and god is the universe, so again, no god of love. Islam proclaims an all-powerful, all-knowing god that gives everything and determines everything, but definitely not a personal god of love. Where do you get the idea that God is love? Liberal New Yorkers might be all for that, but most people in the world don’t see God that way at all. –Tim Keller tells the story of Redeemer Presbyterian Church in his 2008 book The Reason for God: Belief in an Age of Skepticism. His conversations about how we can know God is a God of love can be found in chapter five of that book. Christ the King Sunday sermon, November 26,2017. Remember that line. I will be coming back to it. From the very beginning of Jesus’ ministry, many people had high expectations of him. It is not surprising that they looked for him to be some kind of earthly king. They hated Roman rule, and they hated the cruel King Herod who the Romans had put over them. They had heard about the glory days of good King David, and the prophets seemed to have foretold the return of such a kingdom of peace and justice, free from foreign rule. And when Jesus arrived, the first thing he said was, “The kingdom of God is at hand.” The people’s plans for Jesus are made clear in John 6:15 where it says, “Jesus, knowing that they intended to come and make him king by force, withdrew again to a mountain by himself.” Jesus had something else in mind. The conversation continues. Pilate, the most powerful man in the region, seems weak and confused before Jesus, the handcuffed prisoner. Pilate first declares Jesus innocent; but then caves into the pressure of the crowd and the religious leaders to have him killed. And that very afternoon, Jesus is sent out to be executed by crucifixion, and, to be named the King of the Jews. John 19:19 says Pilate had a notice prepared and fastened to the cross. 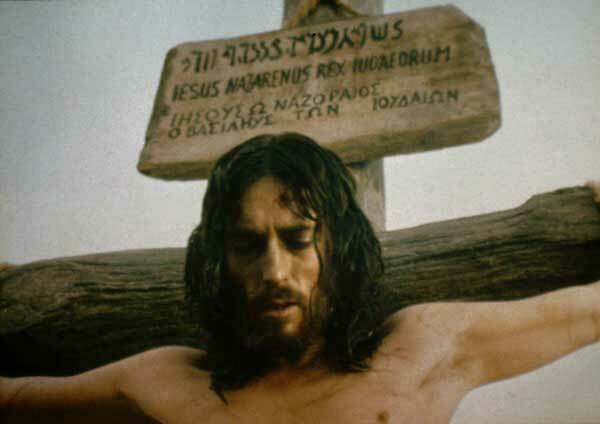 The notice read; “Jesus of Nazareth, the king of the Jews.” It was written in three languages so everyone could read it. Today is Christ the King Sunday. It was on the cross that Jesus was first declared king. Think back now to the words of Jesus to James and John, whose mother wanted them to be at Jesus right and left when he became king. Jesus had said to them, “You don’t know what you are asking.” Well, it is here that Jesus was proclaimed king. The sign said so; that sign posted over his broken and bleeding body, hands and feet nailed to a cross. And who was on the right and left of Jesus? Not James and John, (lucky for them), but two thieves, also nailed to crosses, bloody and battered, with the life draining out of them. I wonder if the brothers were then thinking back to their mother’s request, a request they were in full agreement with. They might have thought it was a good idea at the time, but not anymore. We don’t know what prompted Pilate to put that sign over Jesus head, declaring him King of the Jews. It was probably just to irritate the Jewish leaders. They were irritated and asked Pilate to change it. He refused. Or perhaps it was just in scornful derision of the whole business, declaring a dying man king over a people he despised. But then again, Pilate really did seem intrigued by Jesus, and perhaps putting up that sign was a statement of Pilate’s respect for this good and courageous and noble man, with whom he had one powerful conversation. El Gasim, an African Muslim, saw the sign of the cross one day while praying the usual five times a day in the prison where he was incarcerated. He changed positions but the cross wouldn’t go away. This went on for seven days. He had no explanation for it, except that Christ was calling him to give his life to Him. A Christian pastor, also in that prison, explained that living for Christ would not be without suffering. They prayed together. Other Muslim inmates saw El Gasim praying one day with another Christian prisoner and reported them to the authorities. When summoned to the superintendent’s office, they openly declared their faith in Christ and received twenty-five lashes each. The other prisoner denied his new faith, but El Gasim confessed Christ and said he would face the consequence, no matter what. This enraged the authorities. He was beaten, shackled in chains weighing over fifty pounds and put on death row to be hanged. The imprisoned pastor had great compassion for El Gasim, knowing that if God did not intervene, he was surely staring death in the eye. He told him the story of Paul and Silas in prison, reminding him that he wasn’t the first to be beaten and chained for the sake of Christ. The important thing to remember was that Paul and Silas prayed and praised God, and their chains fell off and the prison doors opened. The pastor confirmed that it could still happen today, because the power that worked then, was still at work today. They prayed together, earnestly seeking God’s will. Acts 16:22-34 — The crowd joined in the attack against Paul and Silas, and the magistrates ordered them to be stripped and beaten with rods. After they had been severely flogged, they were thrown into prison, and the jailer was commanded to guard them carefully. When he received these orders, he put them in the inner cell and fastened their feet in the stocks. About midnight Paul and Silas were praying and singing hymns to God, and the other prisoners were listening to them. Suddenly there was such a violent earthquake that the foundations of the prison were shaken. At once all the prison doors flew open, and everyone’s chains came loose. The jailer woke up, and when he saw the prison doors open, he drew his sword and was about to kill himself because he thought the prisoners had escaped. 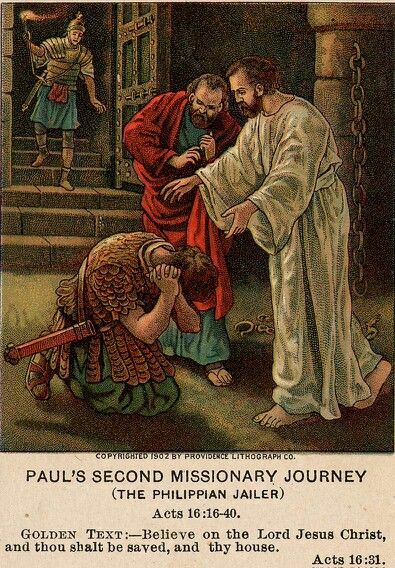 But Paul shouted, “Don’t harm yourself! We are all here!” The jailer called for lights, rushed in and fell trembling before Paul and Silas. He then brought them out and asked, “Sirs, what must I do to be saved?” They replied, “Believe in the Lord Jesus, and you will be saved—you and your household.” Then they spoke the word of the Lord to him and to all the others in his house. At that hour of the night the jailer took them and washed their wounds; then immediately he and all his household were baptized. The jailer brought them into his house and set a meal before them; he was filled with joy because he had come to believe in God—he and his whole household. Lord Jesus, for our sake you were condemned as a criminal. Visit our jails and prisons with your pity and judgment. Remember all prisoners and bring the guilty to repentance and amendment of life according to your will, and give them hope for their future. When any are held injustly, bring them release… Remember those who work in these institutions; protect them, keep them human and compassionate, and save them from becoming brutal or callous… In Jesus’ name. Amen. —Lutheran Book of Worship, Augsburg Publishing House, 1978 (#186). (…continued) An hour later I sat in the sanctuary at the morning worship service. I tried to concentrate, but my mind kept flashing back to the scene downstairs at senior breakfast. What had happened on that cold, drizzly Sunday morning? Hebrews 13:1-2 — Keep on loving one another as brothers and sisters. Do not forget to show hospitality to strangers, for by so doing some people have shown hospitality to angels without knowing it. II Corinthians 9:6-7 — Remember this: Whoever sows sparingly will also reap sparingly, and whoever sows generously will also reap generously. Each of you should give what you have decided in your heart to give, not reluctantly or under compulsion, for God loves a cheerful giver. I wiped my hands on my apron and went out to meet the new arrival. He was a slender African-American, slight and stooped, with hair just beginning to turn gray. He wore neat, though well-worn clothes, and held a hat in his hands. As he spoke in a very soft voice, he looked down toward the floor rather than directly at me. 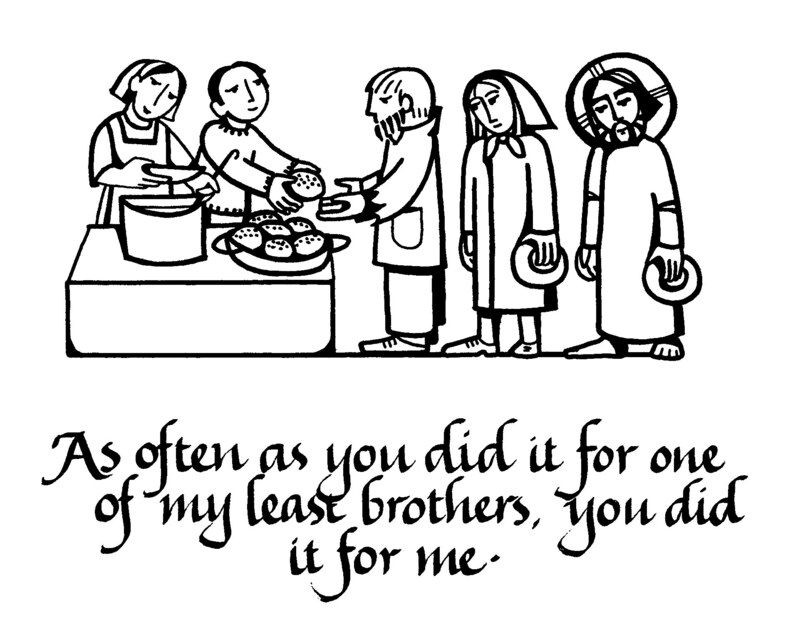 (…continued) This story of Isak is not from the Bible, but it is certainly consistent with what the Bible says about thankfulness. Isak is a man who deeply appreciates what he has received. He not only expresses his thanks in words, but he lets his gratitude shape his whole life, including his obedience to his king. When King Olaf tested his servants in the first half of the story, Isak dramatically showed that nothing would get in the way of his obedience to the word of his king. In the second half of the story, we learn the source of that obedience. Isak lives in gratitude for all that the king has done for him. “All that I have is a gift from you,” he declares. That thankfulness leads not only to obedience, but also to trust, wisdom, and even love for and forgiveness of his enemies, those who are jealously trying to get rid of him. Thankfulness, obedience, trust, wisdom, love, and forgiveness—all are Biblical virtues and all are present in this good man Isak, and the source of all of them is his gratitude. But the story has yet another lesson for us. At the heart of Isak’s gratitude is yet another quality, and that is remembrance. Isak was thankful because he remembered where he came from, remembered what he was without the king, and took time every day to do that remembering. The others in the king’s court were not like Isak. They were not loving, kind, forgiving, wise, and obedient. They were mean-spirited, bitter, hateful, jealous, and self-serving. They were perhaps at one time deeply thankful to the king for giving them such a high position. And even now, if asked, they would probably say, yes, they were grateful to the king. But their lives did not reflect this. They took their blessings for granted, they were proud, and they wanted more. They resented Isak’s favored position and wanted him out of their way so they could be closer to the king; and, they greedily rushed into the secret chamber thinking of all the gold that they thought would be theirs. Isak was not that way, but remained as humble and grateful as the king found him in that field, tending sheep. Why did he remain thankful? Because he remembered where he came from. Every day he went to look at that old tattered coat and the old homemade boots, and he was reminded to be thankful. That is the moral of the story, and that is the purpose of Thanksgiving Day. It is a day to remember to be thankful. It is so easy to forget. It is so easy to forget the big picture of how things really are, and where we would be without God. The temptation is to see only the little picture, only the person across the street, and say, “Why does my neighbor work fewer hours and make more money than me?” Or, “How come she is always able to buy new clothes, and I can’t?” Or, “Why do all my friends get to spend their retirement traveling, and I can hardly get out of bed without help?” We don’t remember the ten million good things God has given us. We don’t remember that he has given us life itself. We don’t remember that he has given us Jesus Christ, in whom we have the promise of eternal life in his perfect home. When we forget all that we can become bitter, and not thankful; and such bitterness can eat away at our relationships with others and with God. We can’t be thankful when we don’t remember. God knew how important such remembering would be for us. It is so important that God made it one of the Ten Commandments. “Remember the Sabbath Day to keep it holy,” says the commandment. What is it do we do on the Sabbath Day? We keep it holy by worshipping God that day, and that reminds us of the big picture. We are reminded that we are nothing without God. We are reminded that as the Bible tells us, “every good and perfect gift is from above.” We are reminded again of the old, old story of Jesus and his love; and all of that builds into us a spirit of thankfulness. Isak remembered the goodness of King Olaf by going up to that secret room every day, and looking at those old boots and that old coat. We remember our King and Lord and Savior by worshiping Him at church, by giving thanks to Him in prayer, and by reading his Word. Without such reminders, we will forget to be thankful. It is remembering that leads to gratitude. Psalm 77:11 — I will remember the deeds of the Lord; yes, I will remember your miracles of long ago. Deuteronomy 5:12 — Remember the Sabbath day by keeping it holy. II Timothy 2:8a — Remember Jesus Christ, raised from the dead. From Stories for Telling, a collection of folk tales by William White, 1986, Augsburg Publishing House, pages 96-100. Isak was King Olaf’s most trusted friend and advisor. When the royal court was in session, Isak always stood at the king’s right hand. Very few people realized that only a few years before this, the king had discovered Isak tending sheep, dressed in a tattered sheepskin jacket and a crude pair of homemade boots. The king had been so impressed with the wisdom and honesty of this simple man, that he gave him a job in the royal court. In a matter of only a few months, Isak became the chief servant and treasurer of the king. Each month Isak brought his master an accounting of all the gold and precious jewels stored in the palace vaults; and he also kept track of the value of all the furnishings of every room in the entire palace. There was one exception to this careful accounting. Nothing was ever mentioned about the chamber in the top-most tower, the room where Isak spent an hour in the middle of each day. No none knew what was inside the thick doors of that mysterious room, for Isak was the only one who possessed a key; and he made no account of what was in there to anyone—not even to the king. “Break it,” commanded the king, setting the pearl on a stone table and pointing to a large hammer by the wall. “That is an interesting answer,” the king said thoughtfully. King Olaf turned next to the second servant. “Do you also judge this jewel to be valuable?” he asked. “Break it,” commanded the king. “Thank you for your response,” the king said softly. One by one the servants refused to break the magnificent pearl, and with each refusal, the king became quieter. Quickly Isak moved to pick up the large hammer. He raised it over his head, and then pounded the precious gem into a pile of worthless dust. A storm of protest arose from all the other servants. “Isak is a madman,” they shouted. When he finished speaking, the other members of the court bowed their heads in shame, and they began to be afraid. “We have allowed our good sense to be swayed by a piece of stone,” they said, and feared for their lives. King Olaf was pleased that Isak had exposed the foolishness and lack of loyalty in all the other members of the court. He signaled for the executioner to draw his sword. Deeply moved, the king pardoned all his servants, who pledged him their eternal loyalty. And then, though the servants were grateful to the king, they were angry with Isak for making them look bad. They vowed to find some way to get him in trouble with the king. The servants grew more and more suspicious, and finally decided to tell the King what they thought was in the room, declaring their belief that Isak was not as trustworthy as he appears. The servants rushed up the stairs, broke the iron lock, and swarmed into the room greedily, looking all around for the hidden treasure. But what they saw confused them. The room was empty, except for a dusty sheepskin jacket and a tattered old pair of boots. Turning to Isak, the king said with a chuckle, “This is indeed a strange treasure that you are hiding. Could you explain to us why these items are so valuable. “Nothing but a shepherd,” sneered all the other servants. Hebrews 2:1 — Therefore we must pay much closer attention to what we have heard, lest we drift away from it. That is the point here: there is no standing still. The life of this world is not a lake. It is a river. And it is flowing downward to destruction. If you do not listen earnestly to Jesus and consider him daily and fix your eyes on him hourly, then you will not stand still, you will go backward. You will float by. 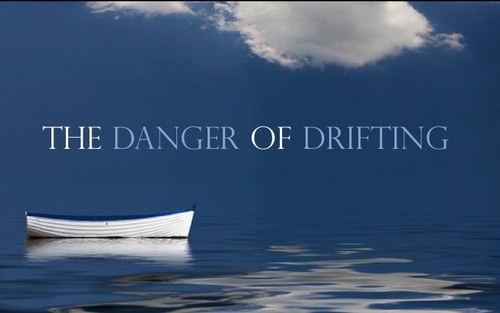 Drifting is a deadly thing in the Christian life. And the remedy to it, according to Hebrews 2:1, “Pay close attention to what you have heard.” That is, consider what God is saying in his Son Jesus. Fix your eyes on what God is saying and doing in the Son of God, Jesus Christ. But let us not complain that God has given us a hard job. Listen, consider, fix the eyes — this is not what you would call a hard job description. It is not a job description. It is a solemn invitation to keep looking to Jesus so that we do not get lured downstream by deceitful desires. Jeremiah 7:23-24 — I gave them this command: Obey me, and I will be your God and you will be my people. Walk in obedience to all I command you, that it may go well with you. But they did not listen or pay attention. Instead, they followed the stubborn inclinations of their evil hearts. They went backward and not forward. 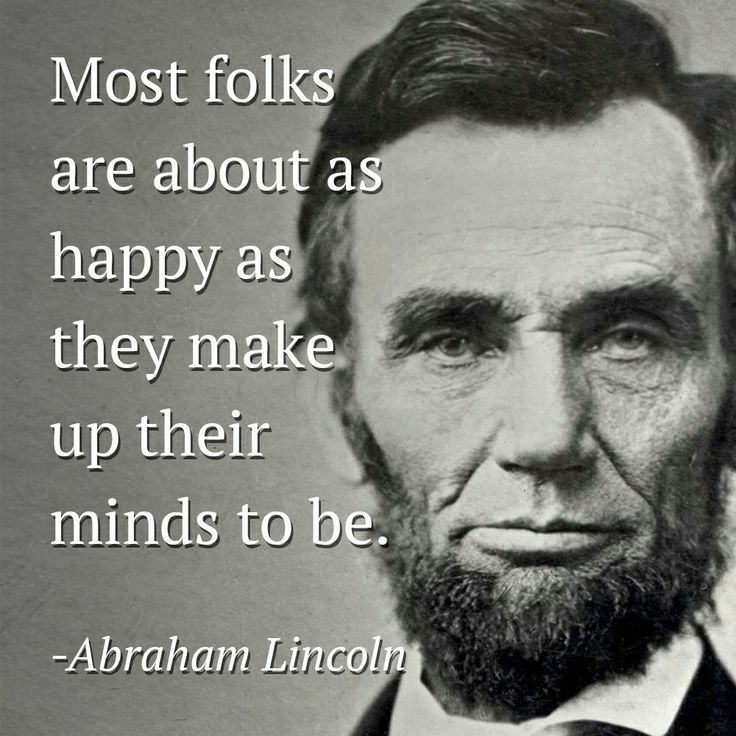 It is not the happy people who are thankful; it is the thankful people who are happy. It was early morning in the big airport. The weather was very bad. Passengers were waiting to find out whether their flights would be delayed, or even cancelled. Ahead of me in the line was a little gray-haired lady. Ahead of her was a man, red-eyed and rumpled, who evidently had just flown in from the West Coast. He was giving the agent a hard time. His flight had been very rough. He hadn’t slept. His plane had been stacked up over the airport for an hour. There hadn’t been enough coffee on board for breakfast; some passengers had to do without. He thought this was disgraceful. He said so, loudly. The agent looked tired himself, but he was patient and polite. He apologized for the weather and for the plane’s late arrival. The man turned, looking surprised. There was quite a long pause. Finally the man said, “Madam, you are quite right. Thanks for setting me straight. It will be a long time before I forget what you just said.” As he turned away, I was told that my flight would be two hours late. I found that I didn’t mind. Then it came to me that I wouldn’t make that decision in old age. You don’t make decisions like that when you are old, and, contrary to the rumor, not everyone mellows with age. I realized then that I am making the decision right now. I am choosing a vision of life. The present moment is the most important moment in my life. I am deciding my future and my old age right now. I must be acting on all the insights that l am getting now because one day, when I am the age of those two men in the infirmary, the habits of thinking that I have cultivated throughout my younger life will take over in me. And I will either say, “Get your face out of mine” or “Thank you, you are very kind, and I am going to say a special prayer of gratitude for you before I fall asleep.” I will be one of those two old people and so will you. And you and I are making our decisions right now in terms of this vision, in terms of the way we are looking at ourselves, at other people and at life. Romans 1:21 — For although they knew God, they neither glorified him as God nor gave thanks to him, but their thinking became futile and their foolish hearts were darkened. I Thessalonians 5:16-18 — Be joyful always; pray continually; give thanks in all circumstances, for this is God’s will for you in Christ Jesus. I Timothy 4:4-5 — For everything God created is good, and nothing is to be rejected if it is received with thanksgiving.